This post is in collaboration with the community science practitioners of Silent Disaster, a grassroots group in and around Waycross, Georgia, concerned with the health problems caused by toxic chemicals. In May of last year @danbeavers and I field tested a prototype plant air purifier in a trailer in Picayune Mississippi. This prototype was built from a metal pot bought at a thrift store that I drilled a hole in and filled with a liquid-tight cord grip. Due to time constraints, the hydroculture growth medium that was included in the original concept for the unit was not used in this first field test and the plant (a golden pathos purchased at Home Depot) was left in its original soil. A cup of activated carbon was added to the soil for added chemical sequestration. The second field test that we are reporting today did utilize the hydroculture growth medium, which is the major design difference. We tested the airborne formaldehyde concentrations in the home both immediately before installing the unit and one month after, indicating a 40% reduction of formaldehyde levels. We used a DIY testing method that did later prove to have some accuracy issues, which prevented us from comparing formaldehyde concentrations across sites, but the measurements had quite good precision at any given site. As a result we do have confidence in comparing these tests in the same location. This confidence could have been increased by running duplicate or triplicate tests. The current field test found the unit to be more than twice as efficacious as the first field test. Our team ran triplicate post-testing, but only a single pre-test. 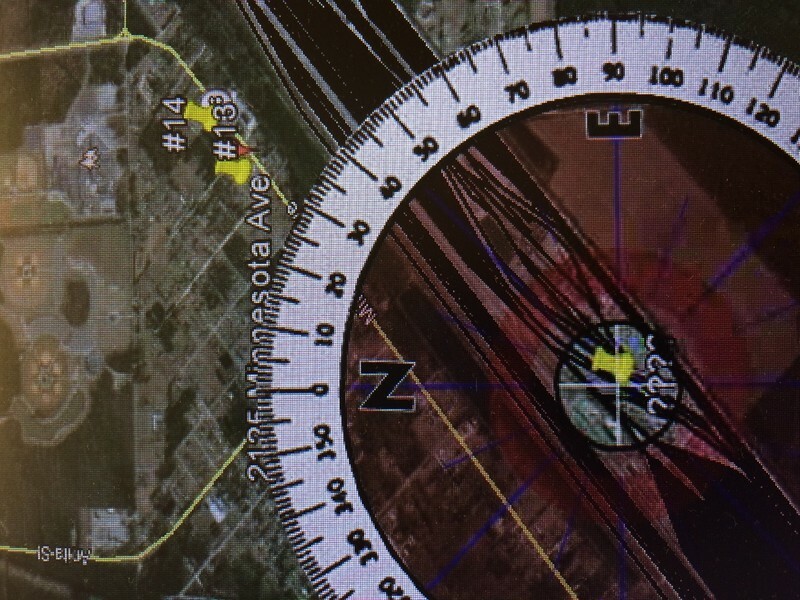 Silent Disaster contacted Public Lab in September of 2015, concerned about formaldehyde levels both in homes and in the ambient air near a number of industrial facilities in Waycross. Three homes of organization members were tested for formaldehyde, using both an active (Home Air Check) and a passive (ACS) method confirming elevated formaldehyde levels multiple times. Based upon the current remediation kit design plans on the wiki, the community scientist at Location #2 built a plant air degradation unit and installed it next to where her elderly mother (86 years old), who had been experiencing cognitive and dermatological issues, sits for most of the day. For this build she did use the hydroculture growth medium. Assembly began on 11/10/2015 and the purifier was installed later that week. Because of the cost of the above types of testing ($67.30-$ 99.85), the Silent Disaster community group looked for other ways to investigate the scale of the issue. They decided to rent a RKI-FP 30 Formaldehyde meter. The meter cost about $300.00 between rental, shipping, and the tabs necessary. Sixty nine percent of the 16 spaces tested in their community registered levels at least double the 0.008 ppm ATSDR minimum response level for chronic inhaled formaldehyde. The manufacturer’s stated detection limit for this meter is 0.01 ppm, with an accuracy of +/- 10 %. In the tables above and below, location 2a is the living room where the plant purifier was placed. Location 2b is a bedroom adjacent to room 2a. 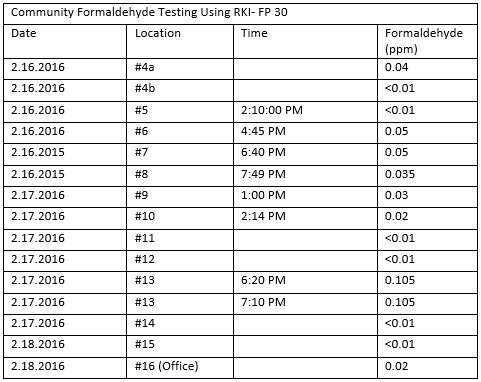 Testing conducted with the RKI meter 12-weeks after instillation of the plant remediation unit indicated formaldehyde levels below the instrument’s 0.01 ppm detection limit. If we assume that a formaldehyde reading below the instrument’s detection level to be equal to the detection level, in this case 0.01 ppm, then the formaldehyde levels appear to have been reduced by 84%. An 84% reduction would be more than double the efficacy of the previous field test without the hydroculture growth medium. Despite being able to “feel the difference” in the air, the occupant had a hard time believing the plant remediation unit had preformed as well as the initial tests indicated. As a result she tested at different times of days and in both the living room (#2a) and adjacent bedroom (#2b). The remediation unit was installed in the home in mid-November 2015. The testing with the RKI was performed February 3-12, 2016. The weather fluctuated on those days between clear, cloudy and light rain. Outside temperatures ranged from the mid 50s to low 80s. The windows in the house were closed and had been closed prior to testing, as is the normal disposition for this house. The air conditioning was on and set at 78 degrees. 5 of the 6 readings, and all of the readings in the room with the remediation planter, were below the RKI detection limit of 0.10 ppm. In addition to the quantifiable decrease in atmospheric formaldehyde, the household also noticed diminished symptoms of exposure. 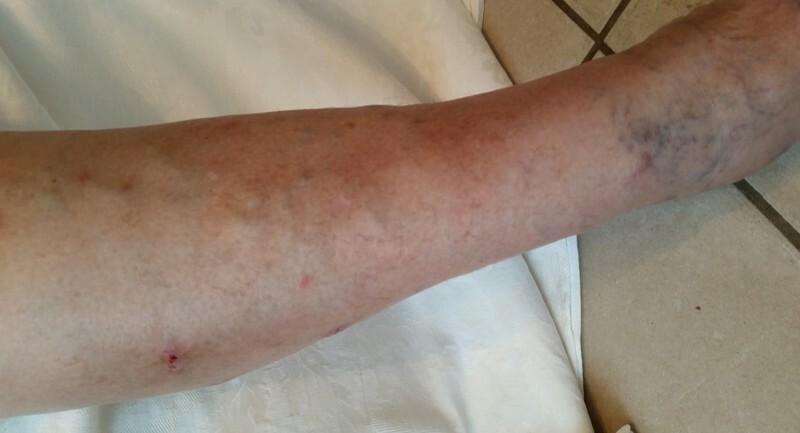 The 86 year-old had improved vision, and most noticeably, she had improvement in her dermatological lesions. 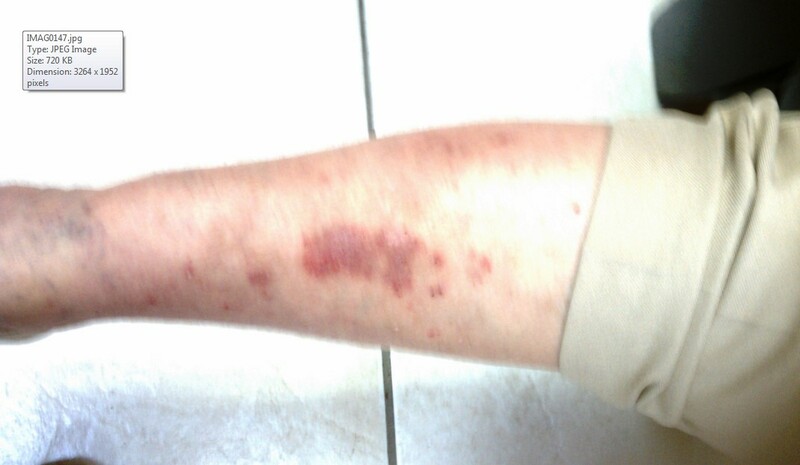 The right leg and hand had previously had large red patches of irritated skin with well-defined above-the-skin knots that would often itch, bleed, and ooze. Most of these symptoms had improved by 70% or better. The community scientist member of the household had suffered from ear ringing and hoarseness, both of which improved after the purifier was installed. Additionally her neurological symptoms of headaches, cognitive decline, and memory loss have significantly improved since the cohabitating with the degradation unit. 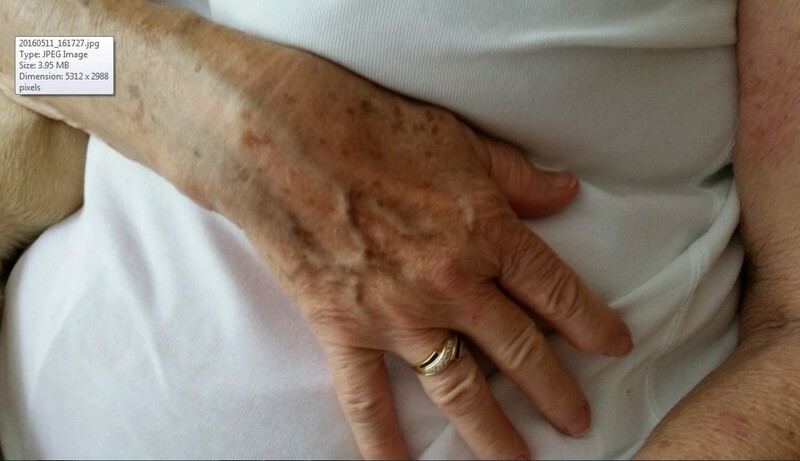 Her mother’s neurological symptoms have shown some, but minimal, improvement. Prior to the installation of the remediation unit her mother was having cognitive symptoms all day long. After using the purifier she has observed that her mother is worse in the mornings and a little better in the evenings, which leads her to believe that she needs to put a remediation unit in her bedroom. While the Silent Disaster member feels an improved home atmosphere, her symptoms resurface for approximately three to seven days when she enters other formaldehyde heavy indoor spaces. 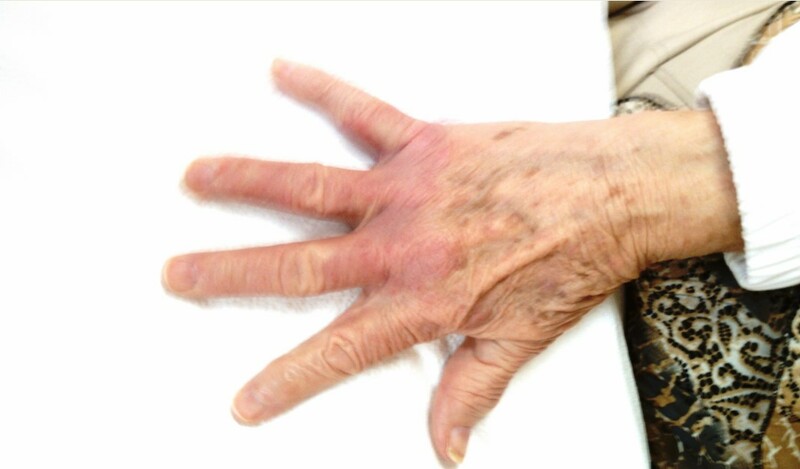 Even a doctor’s office with a printer/copier can trigger the return of these symptoms. The different timeline of potential HCHO exposure and response across these two individuals would be interesting to understand further. Suggested improvements to the remediation kit include 1) using pelleted carbon instead of loose carbon – the pelleted carbon is easier to work with when building the kit; and 2) the use of Activated Bamboo Charcoal instead of just normal activated charcoal. As a result of high exposure to formaldehyde, many people may find themselves chemically sensitive. Normal activated charcoal, which is made from coal products, can trigger reactions in chemically sensitive people. However, sensitive persons seem to be able to tolerate the Active Bamboo Charcoal, which is made from bamboo biowaste. Several of the materials needed to make this kit are most easily and cost effectively bought in bulk. 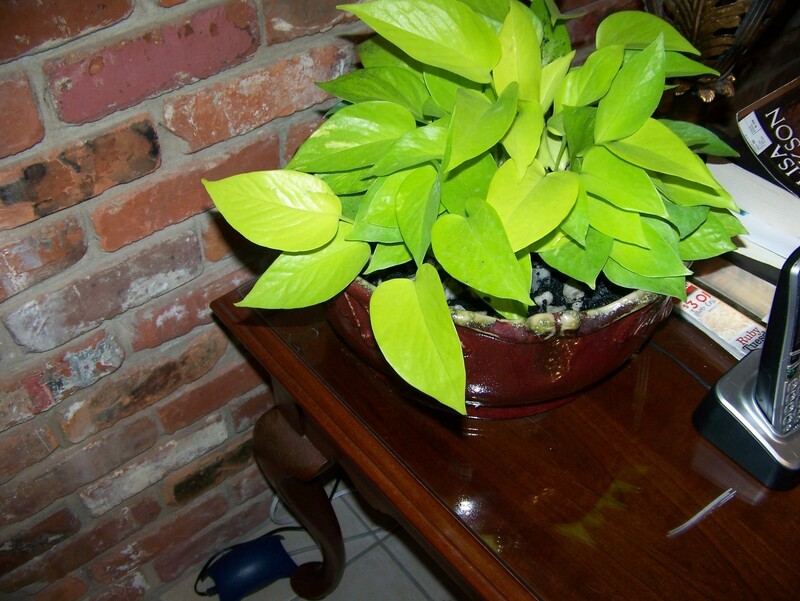 For instance it is difficult to even find single pot portions of the growth medium. Designing a foldable or collapsible pot like this one (but with a waterproof insert) could allow all the materials other than the plant itself to be shipped together increasing the access and dropping the price point. Another option would be to find an already made pot that is light weight and the proper size to serve as the shipping vessel for the kit. This mass producible version of the kit would enable a large-scale beta test that would give us a better picture of the filter’s efficacy and the variables that affect its efficiency and give us the confidence to offer the kit in the store. We will soon announce a grant we were recently awarded to be part of a team that will build a more accurate and lower cost formaldehyde test kit. This test kit will enhance the feasibility of a large-scale beta test by making the pre and post tests cheaper and more reliable. If any PLers have advice on how to refine experimental methods, or propose followup methods to add robustness to its findings, please post below in the comments! Gretchen Gehrke, a community group we have been collaborating with in Pennsylvania and I have been working with Silent Disaster to also monitor outdoor formaldehyde emissions from industrial facilities. So far results have been inconclusive but we will report back full findings as the aforementioned grant progresses. In previous research notes we have been referring to this kit as the plant air filter kit. While the activated carbon could be thought of as a filter component, we want to be clear that sequestering a contaminant is different than degrading it. For this reason we have decided to use descriptors such as “remediation unit” “degradation unit” or even “purifier” rather than “filter” even if its common usage might extend to the functionality of this kit. Hi, Nick - really interesting post, thanks. Is the RKI-FP 30 meter a certified instrument for any regulations, or anything (noting that I think you've mentioned indoor home air is not really a regulated space). I'm also interested in how posts like these could ask for input on how to refine experimental methods, or propose followup methods to add robustness to its findings. This seems complex since exposure is involved, but I'm just interested in your thoughts. Thanks again! Hi Jeff! The RKI FP-30 does not follow an EPA recognized method. For what its worth, the company that makes it claims that their results are very similar (within 0.005 ppm) to the DNPH cartridge method (presumably using EPA federal reference method TO-11A for sampling) when sampling interior air. The TO-11A form of sampling is very cost prohibitive and the group would not have been able to do any testing on their budget with that method. They are very active in trying to get city, state and federal agencies to perform sampling in their community, but were not able to get them to do any testing on this issue for exactly the reasons you mentioned. Silent Disaster is planning on holding a workshop where people can make their own filters and it is unlikely that they will be able to fund having pre-and post testing for everyone/anyone but maybe we can help them use pre and post symptom surveys? Its also a question of who is going to analyze that data if its collected. If this project gets to the point where specific expertise is needed for discrete tasks, i believe we can do outreach over the lists to find someone. How do we organize our projects so it's clear where people can contribute? That's a rhetorical question, but it's also just practical. @nshapiro was so excited to see this work pop up in my in-box. I'll be blogging this on @adafruit tomorrow for #citizenscience. Great work and maybe I can connect with the folks in PA since I'm in Philly. @Zengirl2 fantastic! glad to hear you're interested and can't wait to see the post. I'm in philly too and happy to connect you with some of the PA collaborators although that project is in some what of a holding pattern with the down turn and some other issues. The GA work is moving much more quickly. A commenter in @Zengirl2 's adafruit blog post (which is great btw) had a good point. We don't know which is more effective the plant roots or the activated carbon. So overtime the carbon could reach its limit of HCHO sequestering and if the carbon was doing the lion's share of the work the filter would dramatically decrease in efficacy. The carbon in fish tank filters should be changed every 3-6 weeks. so we could follow up with another test in a couple months to see if the kit's efficacy drops off once the carbon reaches capacity. the problem is that off-gassing should also decrease over time but just not nearly as fast. Symptoms have not returned, and other studies demonstrate that bacterial metabolisms increase as HCHO increases, so both of those things bode well for the continued efficacy of this system. Thinking out loud: so how long do you think it would take before the carbon would reach filtering capacity? or should plan on refreshing the carbon at certain intervals? or should we do tests with just carbon?